Riders registered in advance who have paid the starting fee will be preferred. The core of the route is the circuit from previous years led through the area of Tři Studně, Cikháj, Rumpoltův Mlýn, Devět Skal, Fryšavské hájenky, Samotín, Kadov, Medlov, Vysočina Arena. Entry fee includes standard services: results processed by a chip technology, refreshment stations on the route and in the finish, health service, technical service, lunch, bike wash, bike storage and parking. There is no entrance fee into the Vysočina Arena on Friday nor Saturday! The entrance fee does not include a ticket for the official World Cup program on Sunday. Event withdrawal with entry fee refund is possible until May 21, 2018 at latest. Send your request by email to the Race Director. Cancellation fee of 5 EUR will be deducted from the amount. Entry fee is not refundable after above mentioned date. The elite group on the start will include all riders wih the UCI license and the riders with the wild card. You can apply for the wild card only until May 21, 2018 within the online registration (please add your reasons)! We will accept previous good results at the last Bike Vysočina MTB Marathon or races of KPŽ or Author Cup (positions 1-5 in the finish). All riders have the same start time. Competitor shall place a start number on the front of their bike and keep it visible for the entire race. The start number is assigned only for this particular race. There's a chip for timekeeping glued to the start number. The start numbers will not be returned after the race ends, nor the chips. Participants in the MTB Maraton can have their bikes serviced in tents with the logo of Park Tool. On Friday and Saturday they can be found in the EXPO Zone (before and after the race). During the race, a service station is located at the Rumpoltův mlýn feed station. Bicycle servicing (excluding spare parts) are free of charge. In the Vysočina Aréna, behind the Stands A. Do not use places reserved for the World Cup. Washing bicycles in the pond and stream is strictly forbidden! 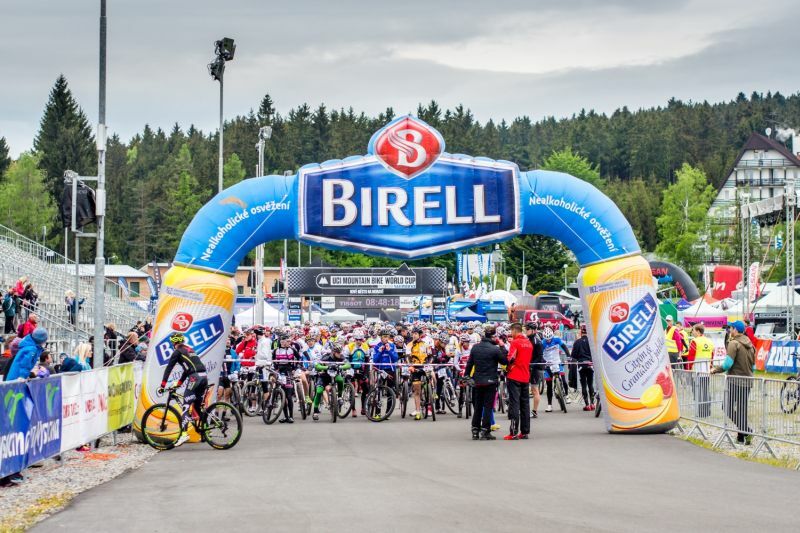 We offer a free-of-charge bike storage for all visitors of the Vysočina Arena as well as for the Birell marathon participants. It is located underneath the grandstand D.
Free-of-charge parking for all visitors of the Vysočina Arena as well as for the Bike vysočina MTB Marathon participants close to the marathon finish (official parking lots of the Vysočina Arena). The awards ceremony will take place on the WC podium in Vysočina Arena. Time will be specified. The race takes place in full traffic and all competitors take part at their own risk. Each participant is required to have sufficient cycling equipment and pay heed to traffic rules, instructions of organizers as well as the Police of the Czech Republic. He/she is also required to behave so not to endanger the health of other participants nor their own. Each participant is responsible for the damage caused. Mountain biking is a demanding sport and each participant should seriously consider their readiness before the start of the race. Full protective helmet is mandatory!!! It is strictly forbidden to use an e-bike! The event takes place in the protected landscape area. It is strictly forbidden to throw away any kind of garbage under the threat of disqualification. The event takes place in the are maintained by the state enterprise "Lesy ČR" (Czech Forestry). These forests belong to all of us, so please behave thoughtfully. When cancelling the race due to sudden natural disasters, epidemics or worsening security situation, the entry fee is not refundable. Participants younger than 18 yo compete at responsibility of their parents or team coaches. They will present their signed agreement at packet pick up at latest.